Spoiled Techie | Who am I? By now you might be asking who I am. You keep reading my posts, but have no idea what I look like or what I do. I am Scott Pio, I graduated from College at Florida Institute of Technology and currently live with my girlfriend Sara in Palm Bay, FL. I work for a Government Company that has been in the news a lot as of lately. I grew up as a kid who took things apart to see how they worked inside. I just had one small problem, I wasn't able to put them back together and of course disgruntled my parents. I am an Eagle Scout with the Boyscouts of America where I spent all my free time, along with being Tomoka Chapter Chief for two consecutive years in the Order of the Arrow. I was expelled out of High school for hacking as a freshman and was forced to stay in High school because of a little A.D.D. I supposedly had. I was no longer allowed to touch a computer at my High School for the remainder of my high school career. I guess I have turned that all around since I work for the Government. I joined a Fraternity called Lambda Chi Alpha which I think has shaped a lot of my life up to today and It was one of the best experiences I could have had. I still participate in it today and love to keep working at it. It has shown me a lot about morals and character. I work on my own projects and ideas on the side and am always looking for another ASP.NET programmer who is willing to have late nights for no pay in the beginning, but I am willing share with you the profits once the programs are actually up and running. I blog because of the ideas I want to keep in my head. I research something or learn something new and want to document it so I keep it in my memory. If people can learn from something I said, hey why not help them out too. What is that Red Lion holding a White Rose for? That picture illustrates "Strength protecting innocence." It is one of those things that has always been close to my heart and I use it on every Blog I post to and all around the Internet. If you see that symbol, it is probably me. 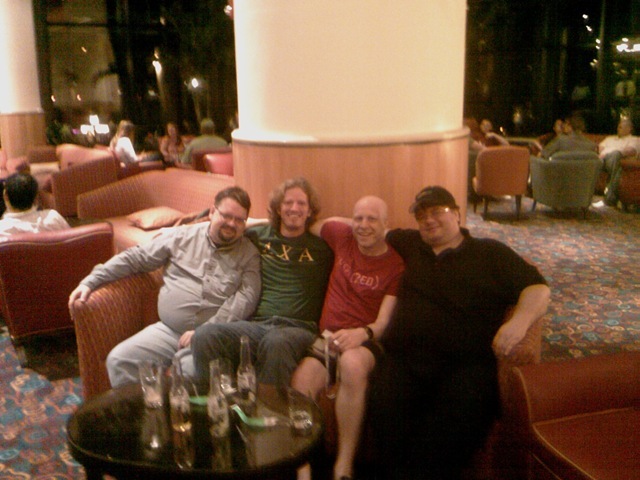 I am pictured below wearing the green shirt sitting with Richard Campbell, Paul Litwin and Carl Franklin. I just think name clicks well for me. I am also known as CheetahTech for another alias, but it doesn't describe a person very well. It describes a company more and I wanted more personalization with the name. P.S. I hand out my resume upon request.